EFB is a fungal disease of cultivated hazelnuts native to eastern North America where it lives, without causing disease, on the native Corylus americana and where its destructive effects on the cultivated hazelnut varieties has so far prevented their adoption as a commercial crop. EFB arrived in Oregon in the 1970’s, where it wrought havoc on the hazelnut industry, and made it to BC around 2003. Many commercial hazelnut orchards in BC now have the blight; some have been cut down, others are dying, most are still productive. In Oregon, some orchards have continued commercial production even with blight present for twenty or more years. 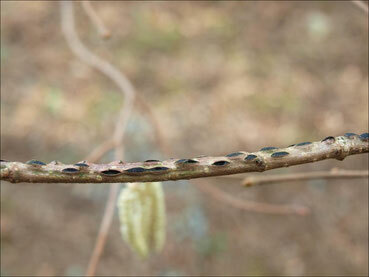 Management strategies include reducing infection through aggressive pruning and spray programs. However, planting resistant varieties is probably the best long-term strategy. Before we get into the new, resistant varieties, you should know a few more things about the blight. 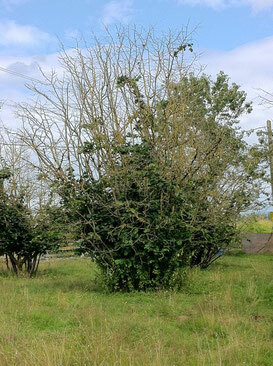 Different hazelnut varieties can be more or less susceptible to EFB but the newly released varieties from the Oregon State University breeding program are all highly resistant, even to many strains of EFB found in the East. However, EFB has many strains or races and it so far appears that few of these strains are present in the Pacific Northwest. If more strains of the disease arrive, the risk of infection increases and the disease organism has more opportunity to evolve and overcome plant defenses. Currently there is a quarantine preventing importation of hazelnut trees to British Columbia (from anywhere the disease occurs, including eastern Canada) except in sterile culture. It is important to keep this quarantine in place to slow the spread of the disease. For recommended prevention and control measures see the BC Ministry of Agriculture web site. Lots more information at the Oregon State Univeristy EFB help page. Also see the EFB page of the PNW Plant Disease Handbook for management options.